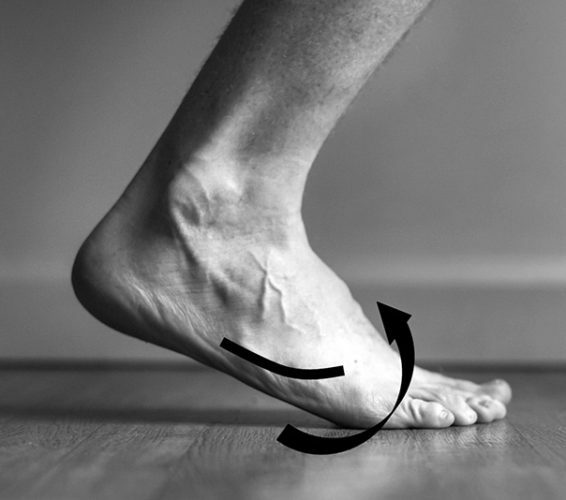 The question of whether a nonrearfoot strike pattern is a potential risk factor for injury in runners with Morton’s foot structure deserves consideration. This alteration of mechanics may be worth consideration as the forefoot strike running pattern, often achieved through methods such as Chi,14 barefoot,15 or Pose16 running, has become more popular. When runners aim to reduce heel strike at initial foot contact, the resulting forefoot strike pattern has been associated with lower vertical loading rates than heel strike running,2 but the plantar flexed foot position in forefoot strikers may increase load on the forefoot during stance. For this reason, runners with a history of stress fracture of the foot are often discouraged from attempting to transition to a forefoot strike pattern. It is estimated that 22% of the population has a Morton’s foot, sometimes called “Morton’s toe” or “Greek foot.”17 Considering this prevalence, the condition likely affects a considerable number of runners who are seeking to transition to a forefoot strike pattern. This raises two important questions: First, in the presence of Morton’s foot, does transitioning to a forefoot strike running pattern magnify the biomechanical demands across the second metatarsal, increasing the potential risk of stress fracture? And second, should this foot type be a screening consideration prior to attempting such a transition? Figure 1. Characteristics of Morton’s foot structure8 include an abnormally short first metatarsal (protruding second ray), hypermobility at the first ray, and resultant cortical thickening of the second metatarsal shaft. During normal walking, the heel is the primary loadbearing structure of the foot. 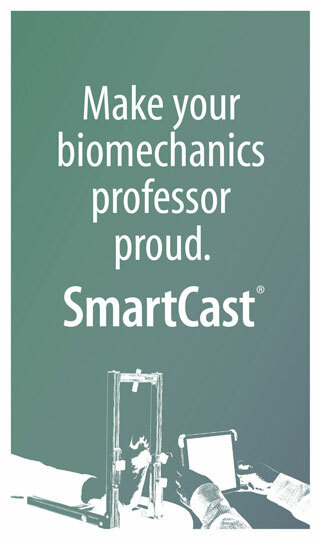 Using plantar pressure measurements, Wearing et al18 demonstrated that in healthy, young individuals the calcaneus reaches a peak force of 80% of body weight by approximately 20% of the stance phase of gait. As body weight is translated forward, load is borne equally between the heel and the second and third metatarsals at around 45% of stance. In terminal stance, the hallux sustains the majority of a 22% body-weight force across the digits, but the primary weightbearing structures late in the gait cycle remain the second and third metatarsals. Wearing et al18 also analyzed temporal relationships among their peak force measurements, demonstrating an interesting interaction among the medial three metatarsals. In terms of time to maximum force, the second and third metatarsals were positively correlated with each other (r = .64, p = .01). The time to maximum force for the first metatarsal, however, was negatively correlated with that of the third metatarsal (r = -.63, p = .01). These relationships suggest the first and third metatarsals may function to attenuate force across the less mobile second metatarsal.18 Although these data were collected at a self-selected walking speed without differentiation of foot morphology, they do provide insight about the distribution of forces across the forefoot in terminal stance. Seeking to define these weightbearing forces with respect to the presence of Morton’s foot structure, Rogers and Cavanaugh13 analyzed plantar pressure measurements during gait in a group of 45 individuals. Thirty of these participants had a Morton’s foot structure, as defined by an in-clinic measurement of a second metatarsal longer than the first (8 mm more distally positioned metatarsal head on average). The remaining 15 participants were classified as having normal foot structure. An arch type index, calculated from plantar pressure measurements, did not differ significantly between the groups. Across all participants, mean pressure under the second metatarsal head (294.6 ± 109.4 kPa) was greater than under the first (243.3 ± 83.1 kPa). The statistical significance of this comparison was not discussed. In terms of between-group differences, the authors noted that the pressure under the second metatarsal head was more distally positioned in the Morton’s foot structure group than in the control group. Again, the authors did not quantify the potential statistical significance of this comparison. The statistical significance of between-group differences in plantar pressure magnitude was discussed, however. Participants in the Rogers and Cavanaugh13 cohort with Morton’s foot structure had significantly higher plantar pressures under both the first and second metatarsal heads than those without the condition; statistical significance was maintained when these values were normalized to body weight. The authors described a biomechanical model in which a relatively long second metatarsal may create two separate axes at the metatarsal break of the foot (Figure 2). As body weight is borne by the forefoot during the latter half of the gait cycle, the second metatarsal may function as a hinge between the two axes, providing a potential mechanism for the heightened pressures observed at this location. A relatively long second metatarsal may create two axes at the metatarsal break of the foot, and the second metatarsal may function as a hinge between the two. The description of increased plantar pressures at the second metatarsal head with respect to increased relative metatarsal length is also supported by a recent cadaveric study. Weber et al19 performed laboratory-controlled plantar pressure measurements on six feet (without presence of Morton’s foot structure) under a mechanically applied force equal to one quarter of body weight. Measurements were conducted under a control condition, then with subsequent 2-mm, 4-mm, 6-mm, and 8-mm aluminum spacers applied to the second metatarsal to lengthen it. A significant association was observed between increases in second metatarsal length and increases in peak pressure under the head of the second metatarsal (p <.001). Increases in pressure-time integral (defined as the product of peak pressure and plantar contact time) under the second metatarsal head were also significantly associated with increases in second metatarsal length (p <.001). Figure 2. Demonstration of the exaggerated separate axes at the metatarsal break in the presence of Morton’s foot structure. A protruding second ray may be a mechanism for increased plantar pressure at the second metatarsal as body weight shifts between these two axes during gait. The previously mentioned Gross and Bunch5 model of the metatarsals as rigid cantilevers during the stance phase of gait suggests the bone shafts are subject to bending strain from the weight of the body. In their study, Gross and Bunch5 collected plantar force data on 21 healthy male distance runners. Force transducers were placed on the insoles of the running shoes, corresponding to the locations of the first, second, third, and fifth metatarsal heads, as well as the hallux (estimated by palpation). Forces were measured while the participants ran on a treadmill at 3.58 m/s, and the mean of five foot strikes was recorded. Consistent with previously described observations, the greatest forces were observed at the second and first metatarsal heads (341.1 N and 279.1 N, respectively). After gathering morphologic data from multiple sources (accounting for bone geometry of the metatarsals), the investigators calculated bending moments, axial and shear forces, and bending strain for each of the metatarsals. The greatest shear force and bending strain were observed in the second metatarsal, while the greatest axial load was observed in the first metatarsal. The authors noted these data are somewhat paradoxical, as the structure of the first metatarsal (larger diameter and relatively shorter length) makes it the most structurally resistant to bending strain. But the first metatarsal sustains an estimated 6.9 times less strain during gait than the second metatarsal, where the smaller diameter and longer relative length actually make it less resistant, suggesting a substantial structural load across the shaft of the bone. The authors proposed this model as a potential mechanism for the incidence of stress fracture in the second meta­tarsal among distance runners. 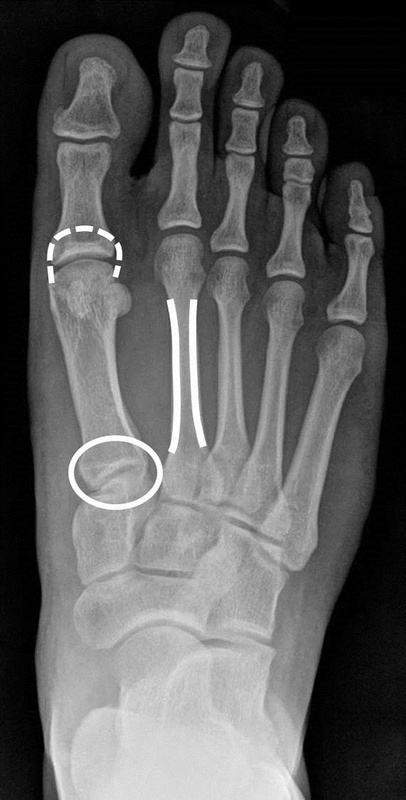 Although mechanically it’s intuitive that the presence of a relatively protruding second metatarsal would correspond to increased structural load across the bony structure, there is little support in the literature for an increased incidence of metatarsal stress fracture in those with Morton’s foot structure. Drez et al10 analyzed files from 65 patients with confirmed metatarsal stress fractures (indiscriminate as to which bone) and compared them with 50 controls who did not have a history of foot injury. Efforts to match the groups with regard to any demographic were not described. Ratios of first-to-second metatarsal length were calculated from radiographs. No significant differences were observed between the metatarsal length ratios in the fracture group and the control group. Derived from their descriptive data, the authors proposed an objective definition of a “short” first metatarsal: A first-to-second metatarsal length ratio of less than 73% represents the range outside two standard deviations from the mean. Figure 3. Cantilever model of the metatarsals during stance and demonstration of the resulting bending strain. Running, shear forces, and bending strain have been calculated to be greatest across the second metatarsal. Chuckpaiwong et al20 focused their retrospective analysis on different stress fracture locations along the shaft of the second metatarsal and attempted to identify potential risk factors for the different sites. Nine patients with proximal stress fractures of the second metatarsal (four with bilateral injuries; 13 cases total) were compared with 45 age-matched patients with distal fractures of the second metatarsal. All patients reported their injuries were caused or exacerbated by sports. Nearly half (43.1%) were described as having a short first metatarsal as measured on radiographs. 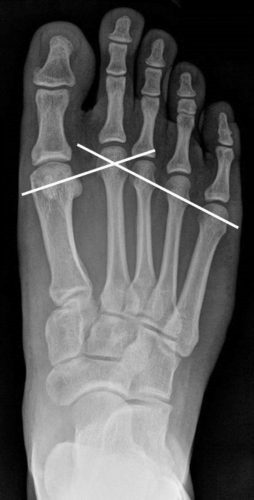 Presence of a short first metatarsal in this study was associated with proximal stress fractures, but not distal stress fractures. Those with proximal second metatarsal stress fractures demonstrated a first-to-second metatarsal length ratio of 80%, while those with distal fractures showed a mean ratio of 95%. Proximal second metatarsal stress fractures are traditionally considered rather unique to ballet dancers, who are routinely subjected to weightbearing forces in extreme plantar flexion.21,22 However, in addition to Chuckpaiwong et al20 documenting existence of these proximal injuries across recreational sports, Guiliani et al23 described two cases in which proximal stress fractures occurred in very experienced runners within six weeks after switching from traditional cushioned-heel running shoes to barefoot-simulating shoes (neither runner was analyzed for Morton’s foot). First-to-second metatarsal-length ratios were not collected on these cases. Instead, the authors proposed a mismatch between running style and footwear design. They speculated that, rather than adopting the forefoot strike pattern that is common in habitual barefoot runners, the runners maintained a traditional heel-strike running gait in their new footwear. This theory would be supported when considering the observations of Lieberman et al.24 A small group (n = 8) of habitually shod runners were asked to run across a 25-m track in both shod and barefoot conditions. Only one naturally transitioned out of a rearfoot strike running pattern during the barefoot trials. In contrast, approximately 60% of natural rearfoot strike runners in a larger cohort25 (n = 41) immediately adopted a nonrearfoot pattern in a barefoot running condition without any cues to do so. It is well within reason that the two runners in the Guiliani et al23 case series self-selected a foot strike pattern resulting in increased weightbearing on the anterior aspect of the foot. Particularly if the runners did not moderate their mileage during the transition, this may suggest a mechanism for their injuries, based on the repetitive bending strain described previously (Figure 3). The results of Ridge et al26 provide further support for the potential of bone stress changes when transitioning to barefoot-simulating footwear. Nineteen of 36 individuals were randomly assigned to make the progressive transition over a 10-week period. The other 17 continued their current footwear and training schedule, serving as controls. Magnetic resonance images of both feet were obtained pre- and postintervention. Blinded radiologists reported the presence of stress reactive changes or stress injury or fracture in 10 of the 19 that transitioned and only one in the control group. Foot strike pattern in these runners was not discussed. The authors did state that pain reports were variable (many of the stress changes were subclinical) and compliance logs were inconsistent, but their conclusion should be well received: They recommended the transition to barefoot-simulating footwear should be approached in a prolonged, controlled manner to minimize risk of bone stress injury in the foot. Regardless of whether an alternative running style is intentionally sought or naturally self-selected when changing footwear, the question of whether a nonrearfoot strike pattern is a potential risk factor for injury in runners with Morton’s foot structure deserves consideration. Although the literature on foot strike pattern in runners does not typically provide details about metatarsal mor­ph­ology, study findings related to meta­tarsal mechanics in general may have implications for individuals with Morton’s foot structure. The work of Kernozek et al27 investigated the plantar forces observed as runners transitioned from traditional cushioned-heel shoes to barefoot-simulating footwear. Thirty female runners were advised to acclimate slowly to the new shoes over four weeks, and then return for an assessment with an in-shoe pressure sensor. Fifteen runners demonstrated a nonrearfoot strike pattern after transitioning. 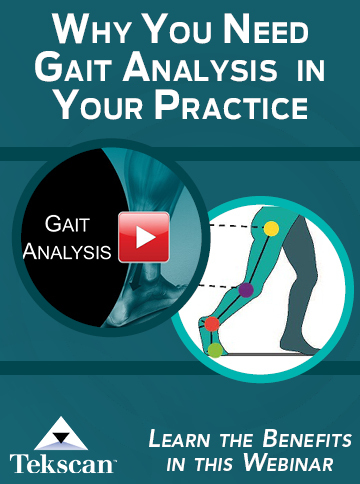 Logically, this pattern yielded reduced pressure at the rearfoot and greater pressure in the forefoot, most noticeably in the central metatarsal region. In describing the effect of alternative running styles on foot contact pressure, Goss and Gross28 defined pressure as applied force divided by contact area. Barefoot running has been shown to decrease the contact area of the foot by 25% to 63% compared with conventional shod running,29 due to less rearfoot contact with the ground. 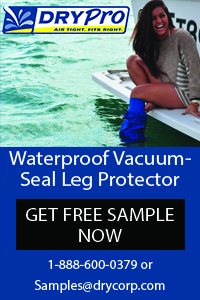 If the applied force remains constant, this reduction in contact area will result in greater pressure. As pressure shifts to the forefoot, the reduction in contact area may counteract the potential benefits of the reduced vertical loading rates associated with alternative running styles. Magee et al30 described how making initial contact with the midfoot during running will concentrate the center of pressure (or Morton’s “axis of leverage”) more anteriorly than a traditional rearfoot strike pattern. Goss and Gross28 suggested this can increase vertical ground reaction impulse stress (force multiplied by time) across the metatarsals, due to the proportionally longer duration of forefoot loading. The advantages of a nonrearfoot strike in runners have become a recent point of emphasis. This is true in the clinical setting,31 but also in recreational running as popularized by Runner’s World.32 Based on the aforementioned mechanics, it is common to exclude those with a history of foot stress fracture from transitioning to a forefoot strike running style. It is less common, however, to take relative metatarsal lengths into consideration when deciding if the transition is appropriate for a given individual. Although it has not been shown to be a risk factor for stress fracture in traditional running, presence of “Morton’s toe” or “Greek foot” is a simple clinical observation that may provide information on potential injury risk to the forefoot prior to adopting an alternative running style. Further research on this theory is required to help answer two questions that are more specific than the two posed earlier in this paper: First, in the presence of Morton’s toe, does transitioning to a forefoot strike running pattern magnify the biomechanical demands across the second metatarsal, creating a potential risk for stress fracture? And second, should this foot type be a screening consideration prior to attempting transition of a runner to a forefoot strike? Brian E. Stoltenberg, DPT, OCS, CSCS, is a sports physical therapy fellow and Donald L. Goss, PT, PhD, OCS, ATC, is an associate professor and fellowship director at the Baylor University-Keller Army Community Hospital Division 1 Sports PT Fellowship in West Point, NY. Authors’ note: The opinions or assertions contained herein are the private views of the authors and are not to be construed as official or as reflecting the views of the US Military Academy or the Department of Defense. 2017 Road Race Trends. Running USA website. http://www.runningusa.org/2017-us-road-race-trends. Published March 23, 2017. Accessed April 2, 2017. Wright AA, Taylor JB, Ford KR, et al. Risk factors associated with lower extremity stress fractures in runners: a systematic review with meta-analysis. Br J Sports Med 2015;49(23):1517-1523. Bennell K, Brukner P. Preventing and managing stress fractures in athletes. Phys Ther Sport 2005;6(4):171-180. Gross TS, Bunch RP. A mechanical model of metatarsal stress fracture during distance running. Am J Sports Med 1989;17(5):669-674. Mayer SW, Joyner PW, Almekinders LC, Parekh SG. Stress fractures of the foot and ankle in athletes. Sports Health 2014;6(6):481-491. Morton DJ, ed. The human foot. Its evolution, physiology, and functional disorders. New York, NY: Columbia University Press; 1935. Glasoe WM, Coughlin MJ. A critical analysis of Dudley Morton’s concept of disordered foot function. J Foot Ankle Surg 2006;45(3):147-155. Drez D, Young JC, Johnston RD, et al. Metatarsal stress fractures. Am J Sports Med 1980;8(2):123-125. Grebing BR, Coughlin MJ. Evaluation of Morton’s theory of second metatarsal hypertrophy. J Bone Joint Surg Am 2004;86(7):1375-1386. Glasoe WM, Allen MK, Kepros T, et al. Dorsal first ray mobility in women athletes with a history of stress fracture of the second or third metatarsal. J Orthop Sports Phys Ther 2002;32(11):560-565. Rodgers MM, Cavanagh PR. Pressure distribution in Morton’s foot structure. Med Sci Sports Exerc 1989;21(1):23-28. Dreyer D, Dreyer K. Chi running: A revolutionary approach to effortless, injury-free running. New York, NY: Fireside; 2009. Robillard J. The barefoot running book. Allendale, MI: Barefoot Running Press; 2010. Romanov N. The Pose method of teaching running technique. Cheboksary, Chuvashia, Russia: Chuvash State Pedagogical Institute; 1988. Young CC, Niedfeldt MW, Morris GA, Eerkes KJ. Clinical examination of the foot and ankle. Prim Care 2005;32(1):105-132. Wearing SC, Urry SR, Smeathers JE. Ground reaction forces at discrete sites of the foot derived from pressure plate measurements. Foot Ankle Int 2001;22(8):653-661. Weber JR, Aubin PM, Ledoux WR, Sangeorzan BJ. Second metatarsal length is positively correlated with increased pressure and medial deviation of the second toe in a robotic cadaveric simulation of gait. Foot Ankle Int 2012;33(4):312-319. O’Malley MJ, Hamilton WG, Munyak J, DeFranco MJ. Stress fractures at the base of the second metatarsal in ballet dancers. Foot Ankle Int 1996;17(2):89-94. Davidson G, Pizzari T, Mayes S. The influence of second toe and metatarsal length on stress fractures at the base of the second metatarsal in classical dancers. Foot Ankle Int 2007;28(10):1082-1086.
Cooper DM, Leissring SK, Kernozek TW. Plantar loading and foot-strike pattern changes with speed during barefoot running in those with a natural rearfoot strike pattern while shod. Foot 2015;25(2):89-96. Kernozek TW, Meardon S, Vannatta CN. In-shoe loading in rearfoot and non-rearfoot strikers during running using minimalist footwear. Int J Sports Med 2014;35(13):1112-1117. Goss DL, Gross MT. A review of mechanics and injury trends among various running styles. US Army Med Dep J 2012;62-71. Molloy JM, Christie DS, Teyhen DS, et al. Effect of running shoe type on the distribution and magnitude of plantar pressures in individuals with low- or high-arched feet. J Am Podiatr Med Assoc 2009;99(4):330-338. Magee DJ, Manske RC, Zachazewski JE, et al. Athletic and sport issues in musculoskeletal rehabilitation. St. Louis, MO: Saunders; 2011: 803. Almeida MO, Davis IS, Lopes AD. Biomechanical differences of foot-strike patterns during running: a systematic review with meta-analysis. J Orthop Sports Phys Ther 2015;45(10):738-755. Douglas S. Runner’s World complete guide to minimalism and barefoot running: how to make the healthy transition to lightweight shoes and injury-free running. Emmaus, PA: Rodale; 2013.